Remember my promise to let you in on my wedding cookie project? That picture up there says it all. In dark brown and in hearts. 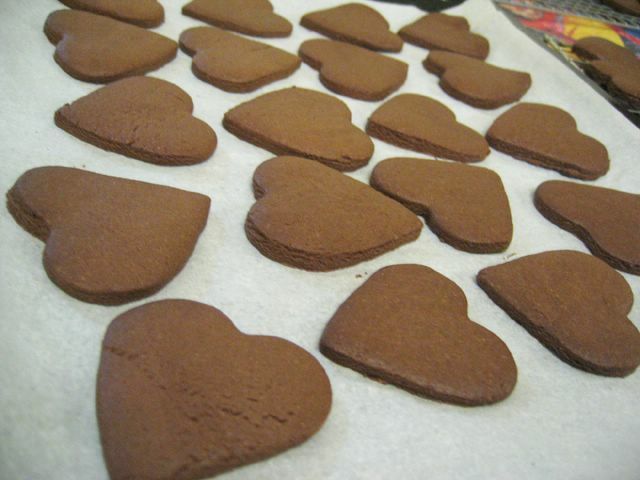 Chocolate Heart Shaped Cookies for a wedding – Jason and Jen’s wedding to be exact. They’re both such wonderful people. Jason is my kickboxing instructor and Jen goes for his classes (duh!) too so that’s how I got to know her. It all started when Jason approached me with a suggestion; that I bake cookies for everyone attending their wedding. And of course I immediately asked “How many?”. He wanted each of his guest to have 2 cookies so the final number came to 230. So I sat there and thought… 230.. okay. It might seem daunting but I should be able to do it since I’ve done this sort of ‘endless baking’ when I do my bake sales. So I said yes. 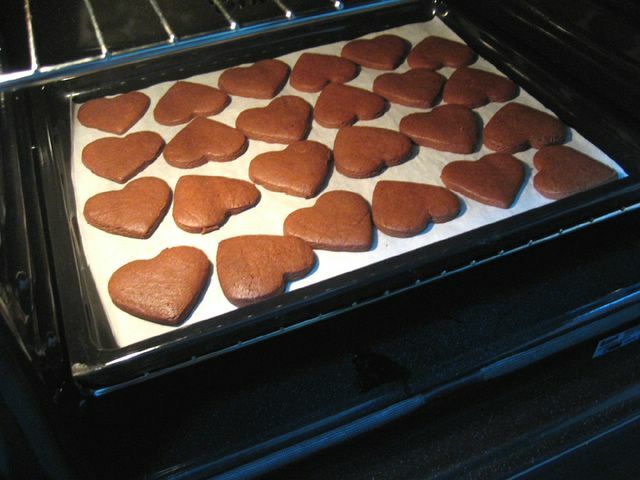 I decided to make it heart shaped and I baked and baked and baked…. I did it over two days. I mixed the dough and left it overnight in the fridge so it’ll be easy to cut the next day. These are chocolate cookies and I used Hershey’s Cocoa. In the end, I baked about 260 pieces of the cookies. So were the couple satisfied? Their wedding was last Friday and it was held at the Singapore Art Museum’s Glass Hall. It was a cosy and sweet affair. Simple, understated and elegant. The bride (Jen) looked stunning in her tailor-made gown! And Jason, the groom recited a poem. It was soooo touching. Wow. God Bless them both! Congratulations to you two once again. May you have a blessed and blissful marriage!! 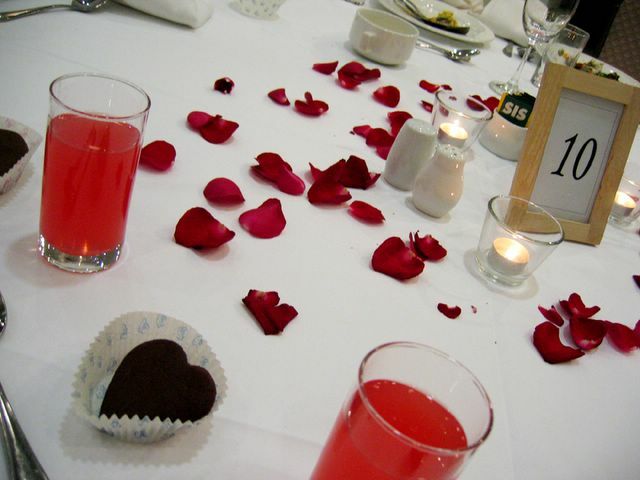 I heard that the guests liked my cookies so that was good to hear. I was relieved that everything went well. To be honestly, I was initially really stressed about not being able to finish baking the cookies on time. But thank God everything went as planned. It’s a simple recipe but I halved the amount of sugar again. It was perfect. I didn’t want the sugar to overwhelm the chocolate taste. Try it – it’s really fool-proof. Okay, time to hit the books! Just 13 days to my exams! EEEks! Cheryl, lovely ‘hearts’ you have there. Good luck for the exams! hi hi~ i always cek out ur blog de..
the cookies looks really nice eh!! i oso wanna try one day! Good Luck for ur exams!!!! where did u get a gd heart shaped cookie cutter that doesn’t lose shape? When u halved the sugar, did you keep the rest of the ingredients at the same amt as stated? i’m gonna try these cookies for an anniversary present. 😉 gonna make them into a sandwich. Shanti: i’m glad you like what you see! 🙂 thanks for dropping by! Angie: thanks! trying to concentrate really hard and refrain from going near the oven. Sing Yin: haha yea you must try for yourself. yea, my other half aways get to sample everything i cook or bake. hehe. thanks for the well wishes! mala: my cookie cutter was from Daiso. But it wasn’t the cookie cutter that did the trick. it was because i refrigerated the dough before cutting it out. It helps retain the shape esp since Sg’s weather is so humid! yes, i kept to the rest of the ingredients. mariya: have fun! these taste great with ice cream too by the way! cheryl, beautiful batch of cookies 🙂 i really admire your stamina & determination! btw, hv u heard of this at-sunrice school? i think its similar to le cordon bleu, where there’s diploma in pastry making. but the fees is like $18,000. its a local school. Nice cookies! n yeah good luck for your exams! Good job babe! The cookies look so yummy and good to eat! I like that its simple and elegant just like the wedding u described. 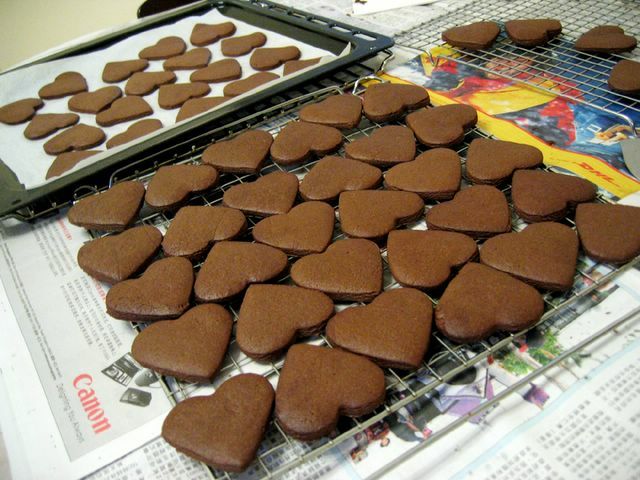 Maybe Id try to bake some for V Day or CNY, hehehehe. May I ask what kind of butter u used? Shd I use normal butter spread or get those in blocks? Hey nice cookies! Are they crispy or soft?? Hello Baker, I like your cookies! The shape of the cookies looks pretty. evan: thanks! ya i’ve heard of at-sunrice. wahhh so expensive??? I don’t have 18k to spare! hahaa hai maybe money will drop from the sky tmw? Jen: they’re crisp. well I used only baking soda. my aunt gave me a tip – for crunchy cookies, use baking powder. for crisp ones, use baking soda. haha not sure what’s the diff though! may i know, when the recipe says 1 CUP, what’s the exact measurement? Or how much would you suggest I follow? Hey~ I love all your yummy food u make! Btw, in the link u posted, it says use both baking soda & powder.. so do you suggest using just one and ommitting the other? i tried doing the cookies. How come mine turned out to be so dry n bitter? It’s very specific and helpfuL! Eunice: heya, yea when I made mine, I used only baking soda. It’s good enough. Baking soda makes cookies crisp while baking soda makes it crunchy. sounds the same to me, but that’s what my aunt said! anon: heya, hmmm did you follow the measurements correctly? check out the measurement equivalent website I pasted above?